Our university is established on 1st may 1983. Earlier it was a part of Nagpur University. After getting separated from Nagpur University the students from this region of 5 districts deprived from getting the admissions to P.G. courses in Science Faculty in Nagpur University. This has severely affected the science graduates passed from the colleges of this region during 1986 to 1990. And hence Senate has taken decision to start the PG Courses in the university during 1990-91. 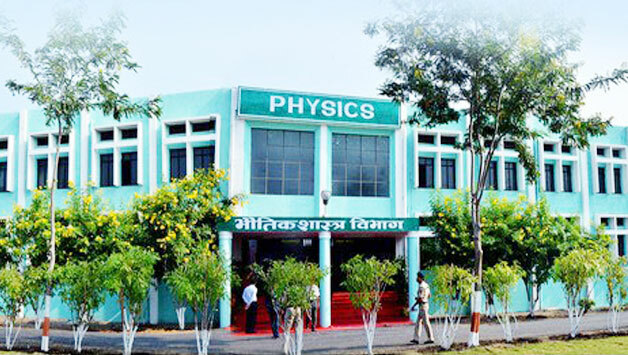 The department of Physics is one of them in the campus. At the beginning the intake was 15 and the teaching is done by inviting experienced people on honorarium basis. Department has offered only P. G. Program consisting of existing core and special papers which has been changed in 1992-93 by addition of new specializations like digital electronics; microprocessor, FORTRAN IV. The syllabus is restructured and modified as per the guidelines of UGC from time to time and currently; the syllabus is of semester pattern with a Choice Based Credit System (CBCS). Various interdisciplinary general interest courses are also introduced as a choice for the students. Presently the intake enrollment is 30 at Semester-I of the course. All faculty members are actively involved in creative research with funding from prestigious granting agencies. The department has been doing research work in the fields like synthesis and characterization of luminescent materials, development of TLD, OSL, RPL materials, SSL phosphors, CFL phosphors, PDP display phosphors, Lasers and their applications, excitation mechanisms in the laser plasma, Gas Sensors and actuators, Biomedical ceramics materials, Bio-sensors NLO materials, Photonics.. During last 5 years the department has published 200 research articles in reputed journals of high impact factors and completed several major and minor research projects and few are ongoing. Few research projects are under process of award. During last five years the department has been awarded FIST Level-1 by DST and Innovative program in Photonics by UGC. Maharashtra State Government had sanctioned 5.50 crores for the construction of the building of which more than 80% amount has been released in installments during last 5years. His Excellency Dr. C. Vidyasagar Rao (Governor of the State) has inaugurated the 3rd phase and also the last Phase of construction. The total Building is ready on 23rd February 2017. This Department is having a very good culture for cultivation of educational values, maintenance of discipline, effective diffusion of required attitudes amongst the students so as to make them competent and very conducive and cooperative atmosphere for learning, teaching and research activities. Physics Is A Science Of Measurements. The Leading Role Of The Physics Education Is To Understand The Nature In A Most Accurate Manner. Logical Thinking And Improvement In The Laboratory Skills Of An Individual Will Definitely Lead To Better Understanding On Fundamental Truths. Exploring The Innovative Methods For Enhancing Accuracy In The Planned Activity Shall Solve The Problems And Challenging Issues Of The Days. Making Future Still Brighter Is The Vision Of This Department. Make Pillars Of The New Generations Still Stronger And More Competent For Accepting The Challenges Of Future For Better Living And Comfort And Eco-Friendly Environment Yet At Affordable Cost. Adequate Training And Motivating The Present Generation For Honesty, Discipline, Accuracy, Precision, Sensitivity With Freedom And Wisdom Shall Necessarily Develop The Positive Attitudes For Peaceful Life For All. To implement innovative ideas for creating eco-friendly environment comforts to the society through extension activities.